With the advent of advanced computer software, GPS systems and improved databases, farm maps can be made for any farm anywhere. Using an aerial photo as the starting point, a combination of digital map data and augmentation with plotted GPS data where necessary, and farmer knowledge, a farm can be mapped cost effectively to a high degree of accuracy. Standard farm maps include a paddock plan with identification and accurate areas, bush, dams, drains, lanes, buildings and more. 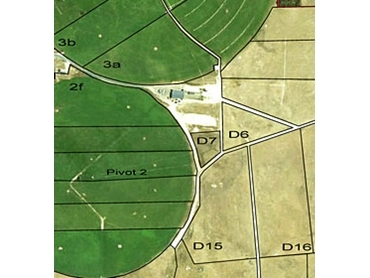 A common addition is mapping of pivot irrigation areas. Farm maps giving accurate pasture measurements have many advantages, including building paddock histories for stock and crop rotation, control of contractor charges, and as a guide to stocking rates. Farm Mapping Services prints maps in a range of sizes and specifications. Farmers can utilise black and white or colour maps, sizes from A4 to A0, maps with or without a background farm photo, ready to fax maps, small credit card size maps or large magnetic whiteboard maps. Magnetic whiteboard maps for the dairy, with customised fridge magnets, have been a popular option in the last few years. They can be manufactured to 1200mm by an extended length. Farmers report that their main advantage is in assisting with day to day communication between staff. For this purpose they are often displayed in the staff break room where it is easy to write messages, record data and alert all staff to any safety issues.